“Guilty pleasure” is not really a phrase in my vocabulary. Not for much of anything—I’m an equally unapologetic and vocal fan of RuPaul’s Drag Race, Taylor Swift, LL Bean river mocs, Thin Mints, Hart of Dixie, Katy Perry, Swingers, Triscuits, that pair of Chloe wooden wedge heels I’ve been kicking around since 2006, Cat News, and tiki drinks. Yep, if I like it, I’ll happily eat it, watch it, listen to it, and tell you about it, with one notable exception: I secretly sneak processed cheese slices every chance I get. Did I say sneak? I guess it’s time to be truly honest about this. I steal them. From my friends. 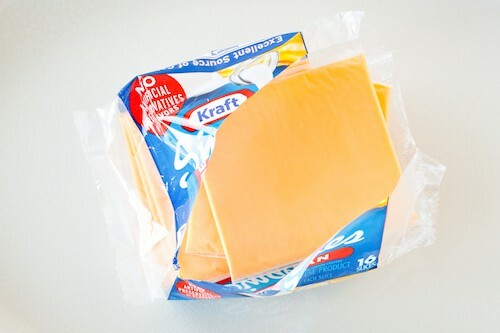 If you keep Kraft Singles or their ilk in your house on a regular basis, and if I have been an overnight guest at your house, then I can pretty much 100 percent guarantee that I have peeked in your refrigerator, grabbed at least one of the slices, silently and stealthily removed it from the plastic wrapper, and stuffed it down my gullet. I don’t get the same frisson of forbidden pleasure when I buy cheese slices for myself, which is why I don’t bother keeping a stash in my own fridge. It’s not that I crave them on a regular basis, even. In fact, the package I purchased to photograph for this story sat uneaten for about a month before I got around to crinkling open the flimsy outer packaging and unsheathing the pliant cheese, sinking my teeth into a corner and feeling it dissolve satisfyingly on the tongue. Then I photographed a few slices, returned the stack to the fridge, and forgot all about them for a few more weeks. There are still a few hanging out in the cheese drawer (formerly known as the crisper drawer) right now. And they’re not tempting me at all with their presence. 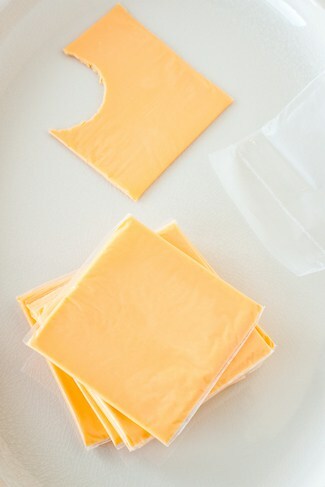 Why are processed cheese slices such a strong source of secret shame for me? They’re essentially flat Velveeta, and I’ve proudly shared my family’s ancestral snack food on this site: Velveeta topped with Heinz ketchup on a Ritz cracker. (True, I eat that maybe once a year, but I’ll still cop to it without guilt.) I’m not afraid to eat an egg-and-cheese breakfast sandwich in public, and we all know the best egg-and-cheese sandwiches come from delis, where American cheese slices are the cheese of choice. So what makes my love for the cheese slice itself so humiliating? As of today, I’m done hiding. You no longer have to worry about keeping your cheese slices under lock and key the next time I visit. It would be nice, actually, if you put them out on the appetizer board with the Boucheron, the salami, and the olives so I can have a nice slice with my happy hour wine upon arrival. Or if you left a blinking neon arrow in your fridge so I’ll know exactly where to look when I have my breakfast slice before hitting the road. I may even keep a stack in the fridge on a regular basis for deli-style egg and cheese sandwiches. Now that my secret’s out, I’m ready for group therapy. Are you willing to divulge your covert food cravings?